This image of the region surrounding the reflection nebula Messier 78, just to the north of Orion’s belt, shows clouds of cosmic dust threaded through the nebula like a string of pearls. Bright beads of cosmic dust highlight a shimmering nebula in a new photo of a region just north of the famous Orion's Belt in the constellation Orion. The Messier 78 nebula, which is also known as NGC 2068, is often called the reflection nebula, because its dust particles reflect the starlight that falls on them. These pockets of dust typically hide more interesting cosmic objects, but the new photo of Messier 78 and its surroundings demonstrates the beauty of dust particles in space. Dense clouds of gas and dust are important to astronomers because they are the birthplaces of new stars. The new image was made from observations by the Atacama Pathfinder Experiment (APEX) telescope, which is located in the Atacama Desert in northern Chile. The telescope detects the heat glow of interstellar dust grains, which enables astronomers to see where new stars are being formed. In the newly released image, another reflection nebula, called NGC 2071, can be seen at the top. This nebula contains a massive young star that is estimated to be five times the mass of the sun. This star is located in the brightest peak seen in the APEX observations, ESO officials said. The lower regions of the image contain mostly low-mass young stars. The observations from APEX are overlaid on the visible-light image in orange. The telescope is sensitive to longer wavelengths, revealing the gentle glow of dense, frigid clumps of dust. In visible light, these veils of dust are dark and opaque, which is why telescopes such as APEX are critical for studying the dusty regions where stars are born. A filament seen by APEX appears in visible light images as a dark ribbon that cuts across the nebula, which means the dense dust lies in front of the Messier 78, blocking its glowing blue light, according to officials at the European Southern Observatory. Another region of glowing dust seen by APEX overlaps with the visible light from Messier 78 at its lower edge. Since the dark lane of dust cannot be found in the corresponding location in the visible light image, scientists can tell that this region of dust must lie behind the nebula. Studying these clouds of dust also reveals fast-moving gas flowing out of these dusty clumps. These winds come from young stars as they are still forming from the surrounding clouds of dust. 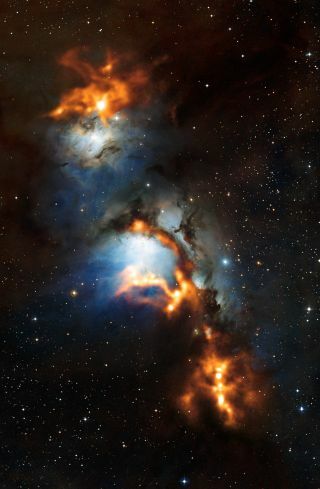 The presence of this high velocity gas is evidence that the dust clouds in Messier 78 are actively forming stars, ESO officials said.